Meanwhile, the houses of the middle classes, beleaguered as they have been, fragile as they are, are surrounded by high fences topped by assorted fierce wires. Some of those houses are as if transplated whole from Surrey - complete with mock Tudor black and white design. The elevation of Harare giving a summer Surrey time temperature all year round. The first two days I went off into the country, visiting projects, greeted everywhere by singing and dancing women (with one or two more reluctant men). Once again I was reminded how the simplest interventions can help - a fence for a group of women market gardeners, chickens multiplying wealth for a poor woman and (my favourite) our 'four bag cement' latrine! since it began disintegrating in 2003 and remains a serious challenge even as the country slowly recovers. Recovery is the word people utter with great care (rightly tinged with scepticism). After the power sharing agreement and dollorisation of the economy, things have slowly improved (inflation had reached 1.3 million percent in 2008 and shops had emptied) but the two parties are locked in a perennial struggle to get advantage and the ever-running Mr Mugabe remains President (though his Duracell batteries do show some signs of faltering). Parliamentary elections are scheduled for this year (though may not take place) and people fear the return of intimidation and violence and all that implies for instability. There is a new constitution to struggle over and that offers a referendum carrying a similar threat of violence. 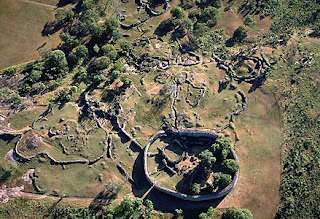 At the end of the first day, we tried to visit Great Zimbabwe, the beautiful stone palace that gives the country its name. But in spite of arriving 20 minutes before closing, the guards were not open to persuasion. So we came back early the next morning, when the king's palace on the hill was wrapped in mist. 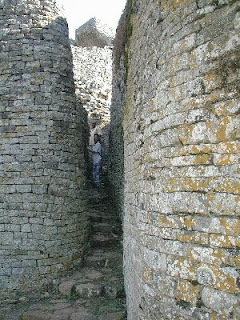 The most impressive building is the Queen's enclosure - high circular walls, made of carefully carved stones (3 times the size of bricks) assembled to heights of 12 metres or more without any mortar or cement. They were built between 1200 and 1500. When they were 'discovered' by missionaries in the early nineteenth century- all kinds of inappropriate, indeed fanciful, theories were advanced to explain them with Prester John much to the fore- anything but they were built by Africans!!! African tradition and Biblical imagery. A friend tells me she slept at the ruins in the early 70s, illegally, and they were and remain a magical place. The landscape about is littered with random rocky hills of extravagant individual shapes, now bare rock, now hidden with clustered, clinging trees, as if a giant randomly cast down stones, arbitrarily but now with accidental beauty. together - neither their communities nor the government will settle for less but are clearly not enjoying the experience. The journey back to Harare was lively. It began to rain, the sky thunderous dark lit only by occasional and spectacular strikes of lightening. Harare is a dark city (with very inadequate street lighting) at the best of times, now it was pitch and you navigated with great care avoiding now invisible potholes, cyclists with lights and pedestrians weaving between indifferent traffic. The hotel in Harare, like much infrastructure in Zimbabwe, is faded but sound. Investing in renewal (or the new) has been so difficult that make do and mend has become the national preoccupation and it is not until this year that tourists have begun to trickle back as the security situation improves and the political temperature goes off the boil (for the time being). It is most decidedly worth it. I had nothing but admiration for our staff - they have been through extraordinary times, traumatic times that would make in anybody a preference for a potentially stultifying caution but they are constantly both navigating all the complexities of the politics of the place and pushing at the boundaries of the new, of what can be done. It was a great privilege to work with them on sketching out some of those possibilities with which to press forward.